Product #22119 | SKU 16276479 | 0.0 (no ratings yet) Thanks for your rating! 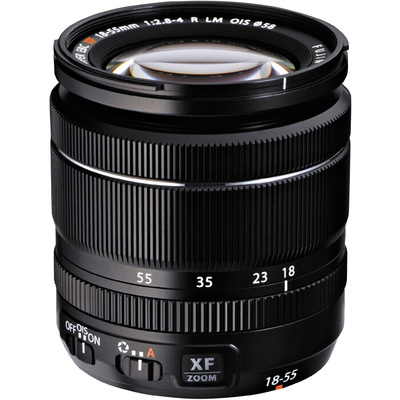 The XF 18-55mm f/2.8-4 R LM OIS Zoom Lens from Fujifilm is the first zoom lens for the X mount on their X-series interchangeable lens digital cameras, and is sure to find a home in the kit bags of many shooters who are already attached to this APS-C sized camera system. A versatile, compact lens that can travel easily and respond to a range of shooting situations, the XF 18-55mm has the focal length equivalency of 27-84mm in the 35mm format. This covers a standard zoom range from basic wide-angle to medium telephoto and is ideal for day-to-day shooting needs from group shots to portraiture, cityscapes to natural vistas. It's a great lens for street photography as well. The f/2.8-4 aperture means the lens will stay fast at most focal lengths and in most shooting situations and its 3 aspherical lens elements and 1 abnormal dispersion element prevent aberration to give you crisp details and accurate colors throughout the image frame. A fast, linear motor-driven autofocus system will get you to your focus smoothly and quickly and keep you shooting confidently. An optical image stabilization system helps to keep your images sharp by compensating for any camera shake, especially in low light and its focus range starts at 30 cm in wide-angle and at 45 cm at the telephoto length. With the popularity of the X-series cameras growing and the lens line expanding, it's great that Fujifilm has introduced this compact, versatile zoom lens.